Market researchers TrendForce are forecasting lower revenue growth for global foundries in 1H18 than in 1H17, with the total revenue reaching about US$29.06 billion, a year-on-year growth of 7.7%, as a result of a weakening demand for premium cellphones. TSMC, GLOBALFOUNDRIES, and UMC are expected to take first, second, and third place. The premium smartphone market experienced weak demand in 1H18, as the vendors blurred the lines between their mid-range and premium models, and the new devices released did not trigger a high level of replacement demand as anticipated. The weak demand for smartphone indirectly reduced the demand for high-performance processors from smartphone vendors, and lowered the growth momentum for foundries to develop advanced process technology. The top ten remains the same as a year ago except for X-Fab surpassing Dongbu HiTek and ranking the 10th. The weak demand from smartphones has also influenced TSMC, which saw lower-than-expected growth momentum. However, the company may still acquire a market share of 56.1% despite the headwinds. GLOBALFOUNDRIES, ranking the second, saw a slight increase. UMC is the third in the revenue ranking for 1H18, with limited revenue growth due to pressure from TSMC's dominant market share in advanced processes. Currently, UMC focuses on developing new customers of products based on 28nm and 14nm processes, in order to consume the capacity. Samsung, at fourth, is actively promoting its Multi-Project Wafer (MPW) service among potential clients, while SMIC, at fifth, is improving the yield rate of 28nm process. TowerJazz has been adjusting its product mix to increase the share of high-profit products but this has led to a 4% fall in revenue over the same period last year. Powerchip has benefited from growing orders and staged remarkable performance, with an estimated revenue growth of 27.1% over the same period last year. As for the production capacity of 200mm wafers, the market in 1H18 shows the same trend of undersupply as in last year. Rising quotes for manufacturing products on 200mm wafers have brought remarkable revenue performance for 200mm wafer fabs. VIS and Hua Hong Semiconductor are expected to record revenue growths of 15.1% and 13.5% respectively. X-Fab is expected to benefit from industrial and automotive markets, recording a slight growth of 4.6% in 1H18. TrendForce also points to the development of third-generation semiconductors. VIS has become the first foundry in the world to provide foundry service on 200mm GaN-on-Silicon wafers, X-Fab has integrated SiC to its 150mm wafer fab with a monthly capacity of 30,000 pieces and Taiwan-based Episil Technologies is also actively developing its foundry service of SiC and GaN wafers. Asus subsidiary AAEON has launched an embedded Artificial Intelligence processing card for edge computing. The AI Core is a mini-PCIe module powered by Intel's Movidius Myriad 2 2450 chip combined with Aaeon's UP Squared companion board for building embedded applications. The low-power 51 x 30mm module can be used to add AI capabilities to industrial IoT edge devices with hardware accelerated deep learning and enhanced machine vision functionality. The card includes 512 MB onboard DDR memory and the Myriad 2 gives developers immediate access to its advanced vision processing core, while allowing them to develop proprietary capabilities for differentiation. The AI board can be used with the Aaeon's credit card sized UP Squared single board computer. This is aimed at different domains and products like Robotics, Drone, Machine Vision, Smart Home, Education, Digital Signage, Intelligent Cars and Internet Of Things via compatibility with Linux, Android, and all the Windows 10 distributions. The UP is powered by an Intel Atom x5 Quad-Core 1.44/1.92Ghz 64-bit SoC (Cherry Trail) and HD 400 graphics (H.264, HEVC decoding, VP8 is supported), with 1GB/2GB/4GB RAM, 16GB/32GB/64GB eMMC storage, 40-pin GPIO expansion, 6x USB 2.0, USB 3.0 OTG, Ethernet, HDMI, MIPI-CSI/DSI and hardware security. Perhaps slightly behind the times, Toshiba has finally certified two of its ARM-based microcontrollers for the mbed operating system developed for the ARM cores. Mbed provides developers with a free, easy-to-use development environment, so there has been less commercial drive for mainstream chip suppliers with their own operatings sytems and tools to support it. The online compiler provided by Arm can be used with the new evaluation boards, and device programming can be performed with drag-and-drop simplicity on a host PC connected to the boards via USB. Developers can also access the component libraries verified by the Mbed community, allowing fast and efficient development of applications for embedded devices. The key difference now is that the Arm Mbed Device Connector service provides connectivity with the Mbed Cloud, simplifying configuration of web services and providing something that Toshiba doesn't. Another factor is the corporate structure. It is Toshiba Digital Solutions rather than the semiconductor division that is working on strengthening device security of IoT equipment as an Mbed Cloud lead partner to provide that connectivity. Toshiba will be expanding products supporting Mbed OS with Mbed ecosystem partners through the Cortex-M0 and Cortex-M4 based microcontrollers. The 24MHz TX00 general-purpose microcontrollers provide USB support function while the TX04 microcontrollers add security functions. There is also support for a wide range of applications via an Arduino-compatible connector so that applications can be developed quickly by connecting to a commercially available ArduinoShield board. Using Mbed Cloud allows secure connection with web services. Rambus has moved from being a patent and technology licensing company to a product and now an IoT services company that wants to take on ARM. Nick Flaherty talks to Jerome Nadel, the chief marketing officer, on where the company is heading, from cold computing in data centres to secure core IP and software technologies. The interview at EEnews Power covers the moves into secure cores and ioT services. “The vision hasn’t fully materialised, but with features as a service, you start at the fab and then in the field update it securely with new services,” he said. This opens up a service model, where customers or Rambus can manage the updating of the chips in the field. The company has developed a secure core that can sit alongside a mainstream processor to provide this capability, starting with the RISC-V core. “We silo the secure processing from general processing and partnering with SiFive and promoting open source hardware, this notion of cores that can be programmed and addressed in field is a very relevant model – design starts are so expensive you could democratise those and make money in the field,” he said. “On the platform level you have to be open to other cores so we [interface to processor cores from] TI, ST, Synopsys, our infrastructure interfaces with our cores and other cores – we have interfaces for a set of cores with a software development kit (SDK) and product development kit (PDK). French IoT radio network provider Sigfox has launched an end-to-end IoT sensor system to accelerate the adoption among business and technical professionals on its proprietary network. Sens'it Discovery is a customizsble IoT systme that combines the Sens’it 3 device with the sensit.io application, along with Sigfox connectivity. The device combines 6 different sensors (thermometer, hygrometer, light meter, accelerometer, magnetometer, reed switch) and a central button for multiple use cases. Sigfox sees the device being used to secure and monitor facilities, customer service, and provide environmental data. Developers can also turn the device into a development kit, create their own firmware, and fully re-configure the device using the dedicated Software Development Kit SDK available on www.sensit.io. This allows them to get get direct access to the device data on the Sigfox Cloud and create new application integrations, as well as build custom embedded applications to completely change the device behaviour and adapt sensors’ logic to create new uses and solutions. Additionally, Altyor, a long-time partner of the Sigfox ecosystem, offers the opportunity to purchase large quantities of Sens’it sensors. Devices can be then adapted for new use cases, with new embedded applications easily created with Sens’it SDK and with a customizable front panel to match with the targeted use case. This provides an easy way for developers to start experimenting with a few hundreds of connected sensors. Saelig has launched a compact, easy to use narrow-band embedded radio modem operating in the 434 MHz ISM band using the LoRa technology to achieve extremely long range for low bit-rate data with low power. The SLR-434M's receive sensitivity allows communication into areas once considered difficult for RF to penetrate, and making it possible to transmit 1800 feet or more. The SLR-434M is also switchable to accommodate conventional FSK communication. The SLR-434M can transmit data or operate in simple control systems using Circuit Design's dedicated command protocol from an external CPU or PC via an RS232 or COMport interface. The SLR-434M can process 8 I/O switching signals. 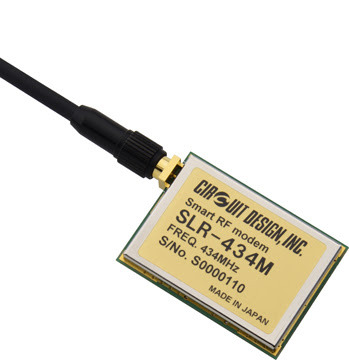 With up to 10mW RF output power from the SMA connector, the SLR-434M can be used in simplex or duplex mode on 137 channels. It operates from a 3.5 - 5.0V supply, consuming less than 30mA when transmitting. Its low power consumption makes battery operation possible with the 1.6" x 1.2" x 0.25" module. Applications include data transmission, telemetry, and control in buildings, water level and dam monitoring, tunnel and bridge condition monitoring, etc. The SLR-434M is made by Circuit Design, a leading Japanese low power radio product design and manufacturing company.